By fuel, I mean petrol or gas, whatever you like to call it where you are. Some tips that are good for your wallet and the environment are around reducing fuel consumption when driving. Drive like Evel Knievel and you’ll pay for the thrill. Wind resistance increases dramatically with speed so, for every mile per hour over 55 you drive, your fuel economy goes down by 2 percent. Speeding, sudden braking and jack-rabbit starts are notoriously inefficient ways to drive. Not only will driving sanely maximize your fuel efficiency but it will also reduce wear and tear on your vehicle. You can read the full lower your fuel consumption article here. These might actually work! The Business Insider’s Green Sheet goes through six sources of permanent alternative energy at various stages of development. There is no guarantee they will work, of course, but researchers are spending billions of dollars into trying to find alternative energy technologies that provide power as consistently fossil fuels. Wind, algae, waves and more are used, so take a look. 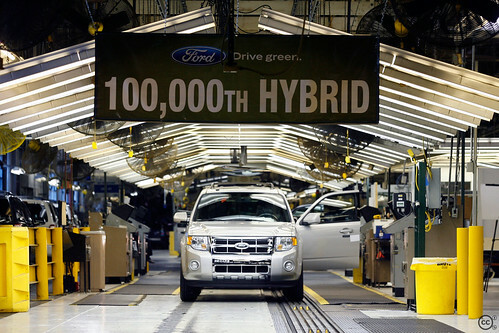 Ford has produced it’s 100,000th hybrid, rolling off the line in Kansas City, with next generation hybrid, battery-electric vehicles and a plugin hybrid coming in 2012. Currently the hybrids are just the Ford Escape and Mercury Mariner vehicles, but the much discussed Ford Fusion hybrid, and the Mercury Milan hybrid come out next year, 2010. With an increasing commitment to alternative fuels, and more environmentally friendly vehicles, hopefully the next 100,000 come along much sooner. Read more about it here. JJ Beck and Joey Carey’s terrific documentary about alternative fuels, Greasy Rider, is now available to rent and purchase (such as on Amazon.com). The documentary is a cross-country road trip powered by vegetable oil in a 1981 Mercedes-Benz. Greasy Rider follows the two filmmakers, Joey Carey and JJ Beck, as they meet with fellow Greasecar drivers, friends, and critics. Some of the guests in the film include Morgan Freeman and Yoko Ono. You can watch the trailer/preview below.